Lee leaving the journey meant taking stock a little bit. 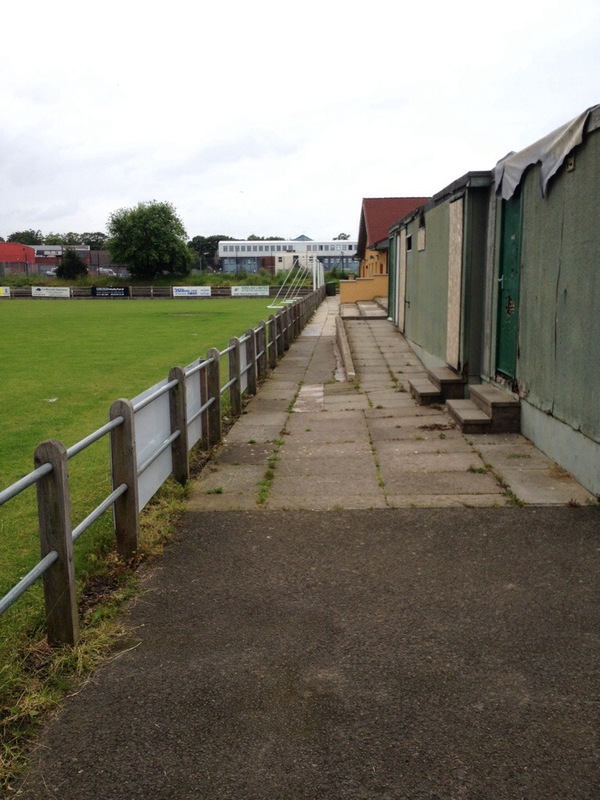 We’d been in touch with loads of clubs who’d agreed to open up their grounds to us and chat, but I didn’t really fancy facing them alone. As I headed into Edinburgh city centre on the way to the train station I had to decide whether to continue or pack in and call it a day. 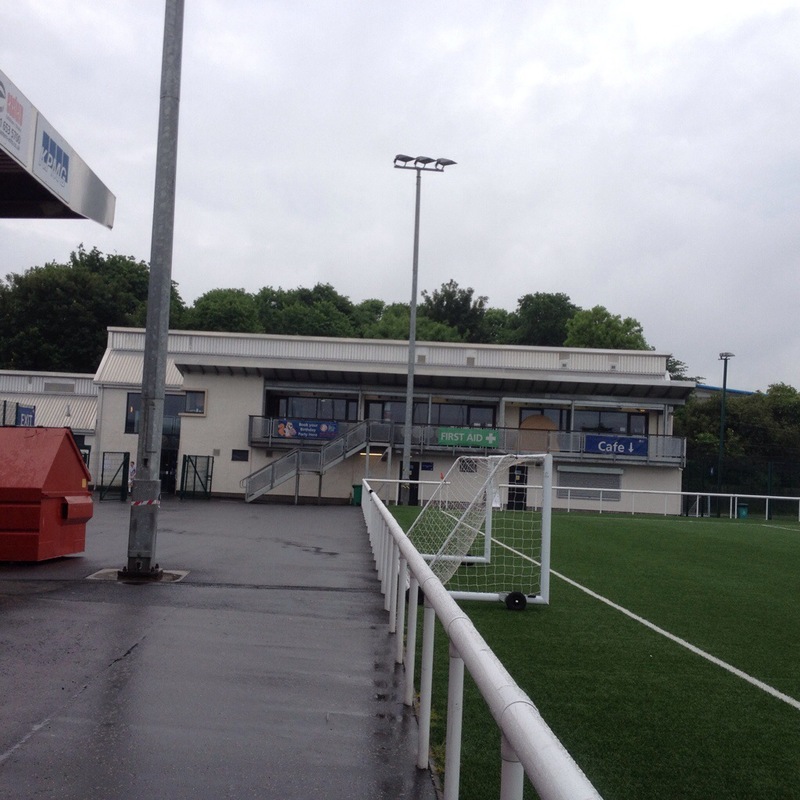 Lee wouldn’t even let us stop as we passed Meadowbank stadium, home of Edinburgh City. 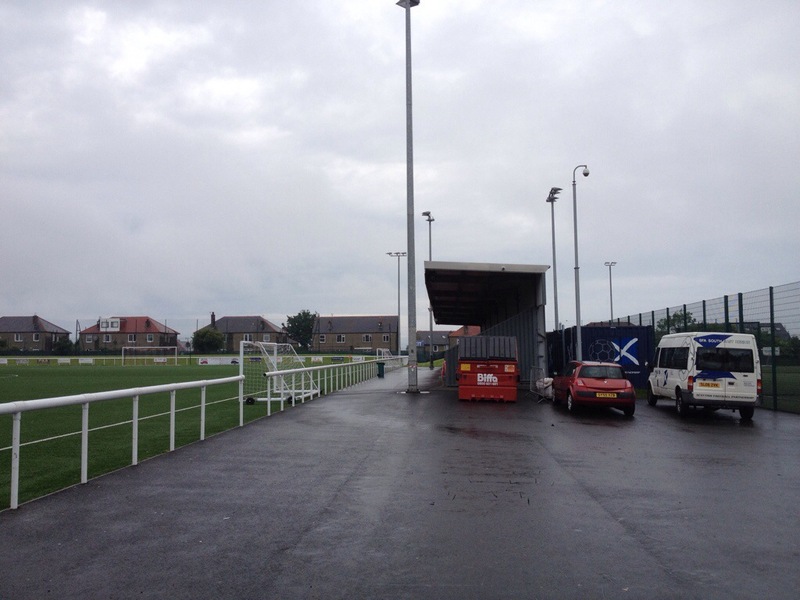 I knew there and then I wasn’t finished though and so made my way to Ainslie Park. 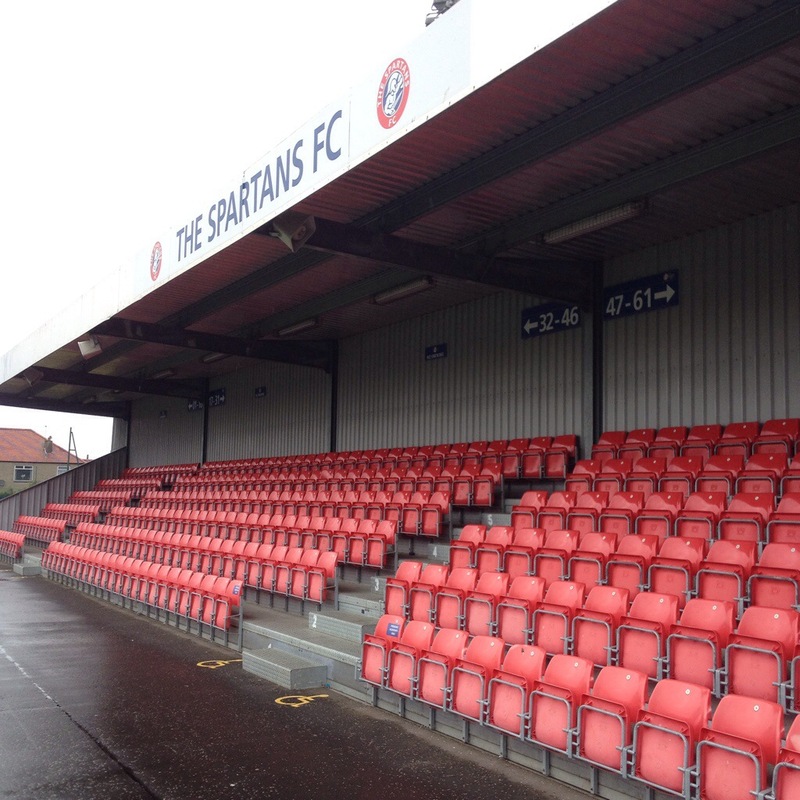 So whilst I can’t add Spartans to the list of wonderfully hospitable Scottish hosts, I’ve no doubt at all that they would have been excellent company and you’d have gotten to see even more of the ground than these photographs allow. 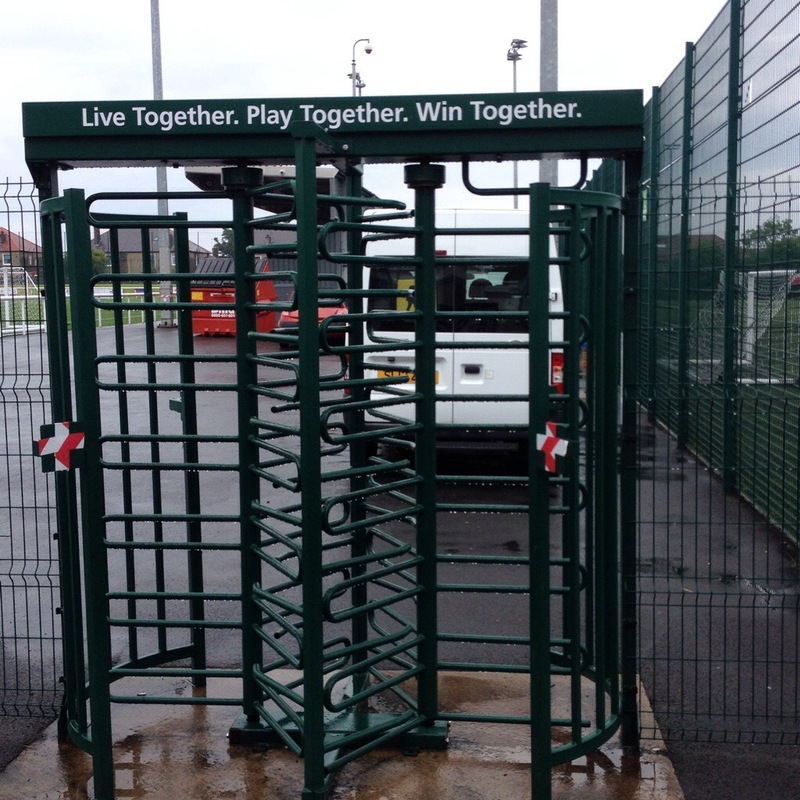 That’s probably a slight exaggeration, but as it’s open as a community facility during the week turning up and walking around is a doddle. 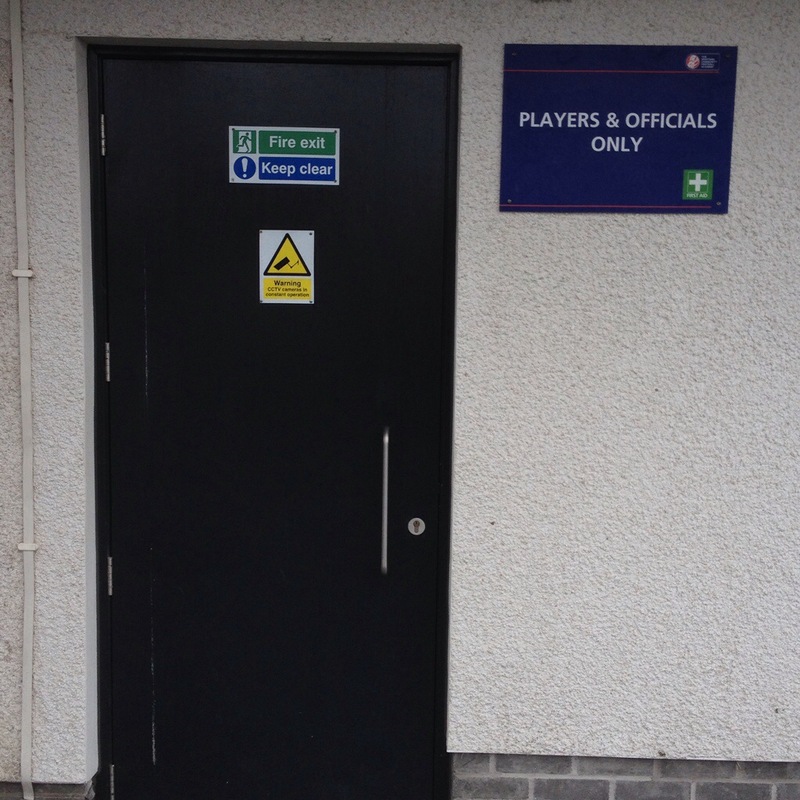 There are turnstiles there so that it can be closed off on a match day but on a Monday afternoon there were no such worries. And that is probably Spartans’ main downfall in terms of where it ranks as a stadium. 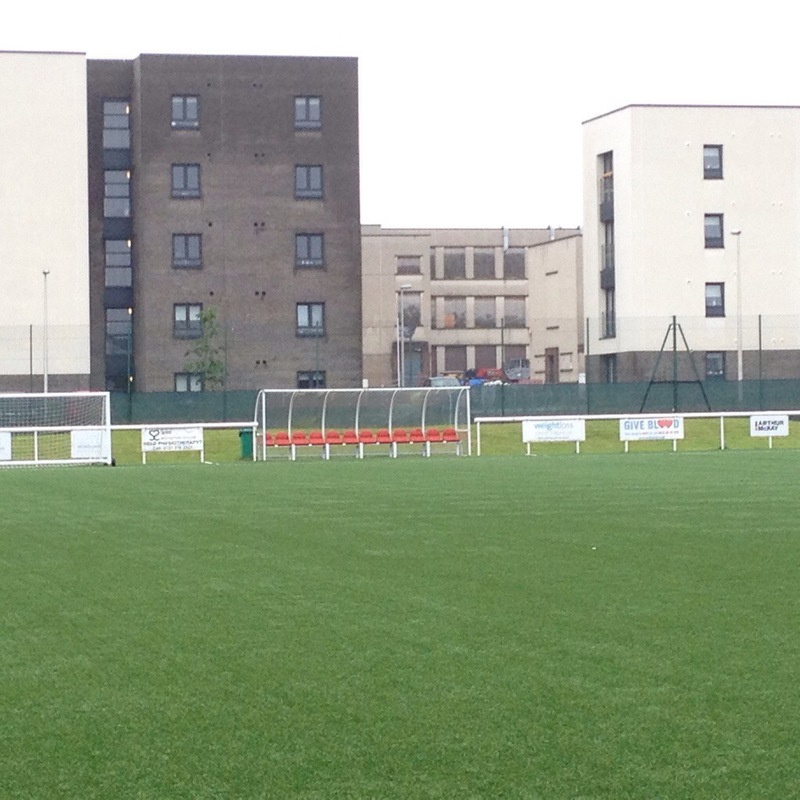 It’s basically an artificial pitch with a big modern stand on the touchline. 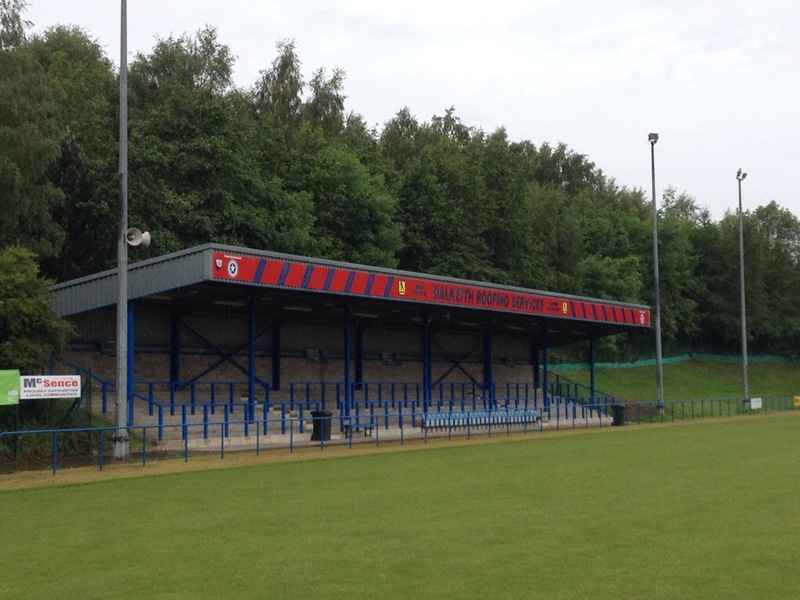 An impressive stand all the same, but it’s hard to think of it as a ground rather than simply a sports facility. Fortunately this blog tends to focus as much on what it’s like as a visitor driving past and so whilst it might not bring back misty-eye memories in the way that some of the older grounds do, it scores pretty much perfectly on being able to turn up and see everything there is to see. 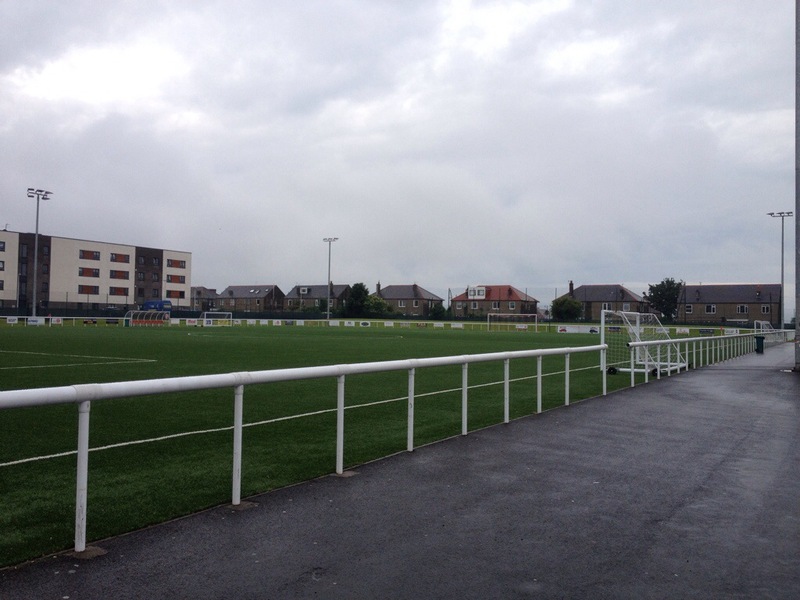 So as much as I’m no fan of 3G pitches at football grounds, and there’s not loads to occupy your eyes at Spartans, there’s no doubting a drive-by is worthwhile if you’re in Edinburgh. For me, it was the end of day one on an eventful groundhunting day. 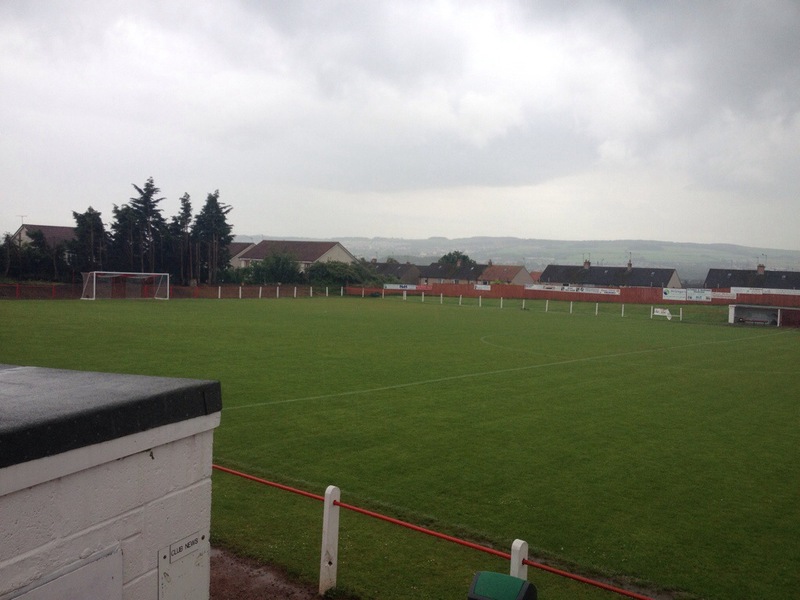 I’ll probably post an English ground next week before resuming the Scottish odyssey with Rosyth FC in a fortnight. This will go down as one of the worst grounds on our journey for a variety of reasons. Mainly, in a dramatic twist, as it was Lee’s last. It’s like an episode of Heartbeat at times, this little blog. A phone call from home as we pulled into the club car park resulted in him needing to head back to the North East, meaning it was a solo flight around the rest of the grounds. 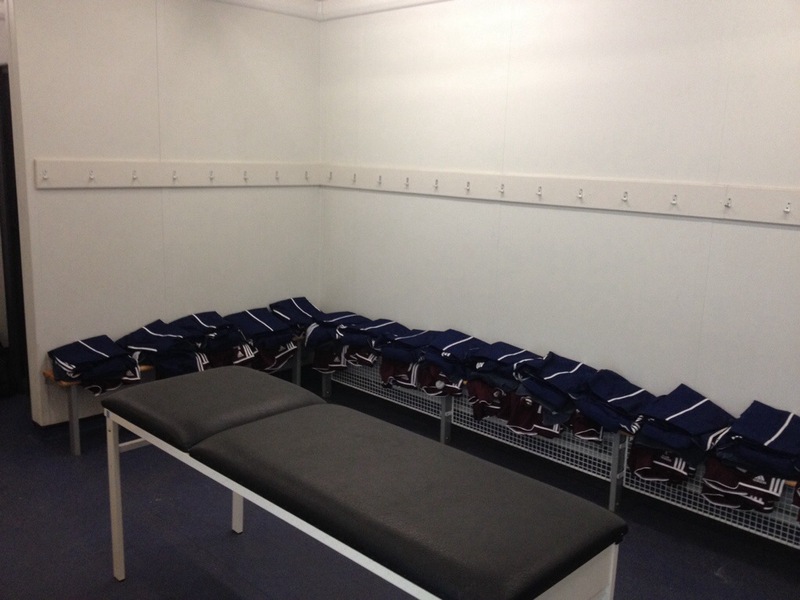 Also, nobody from the club had gotten back to us about us having a look around. 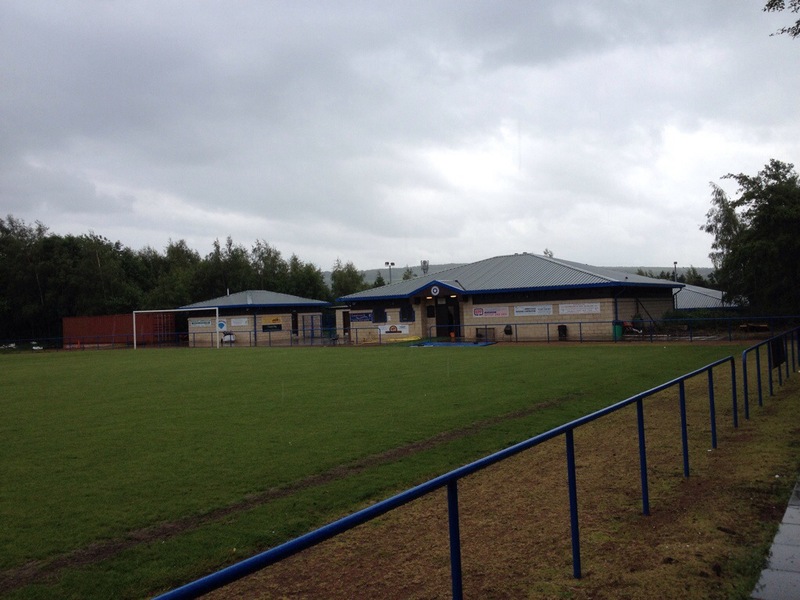 I know that’s not necessarily the point of this blog, but considering the hospitality that the likes of Newtongrange Star and Musselburgh Athletic had shown, it was a bit of a let down. 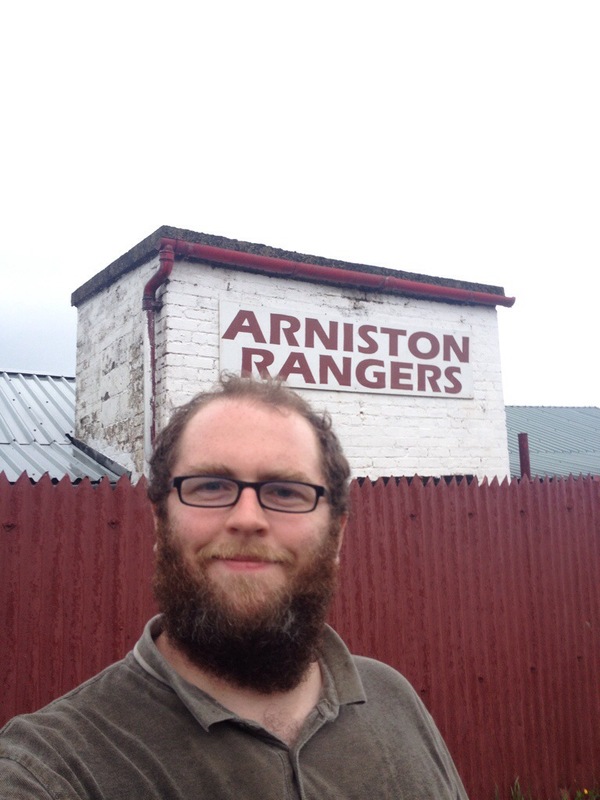 Even someone from Hampden Park had got back to us to say we could pop in when we reached Glasgow! There’s also not a great deal can be seen from the outside anyway. 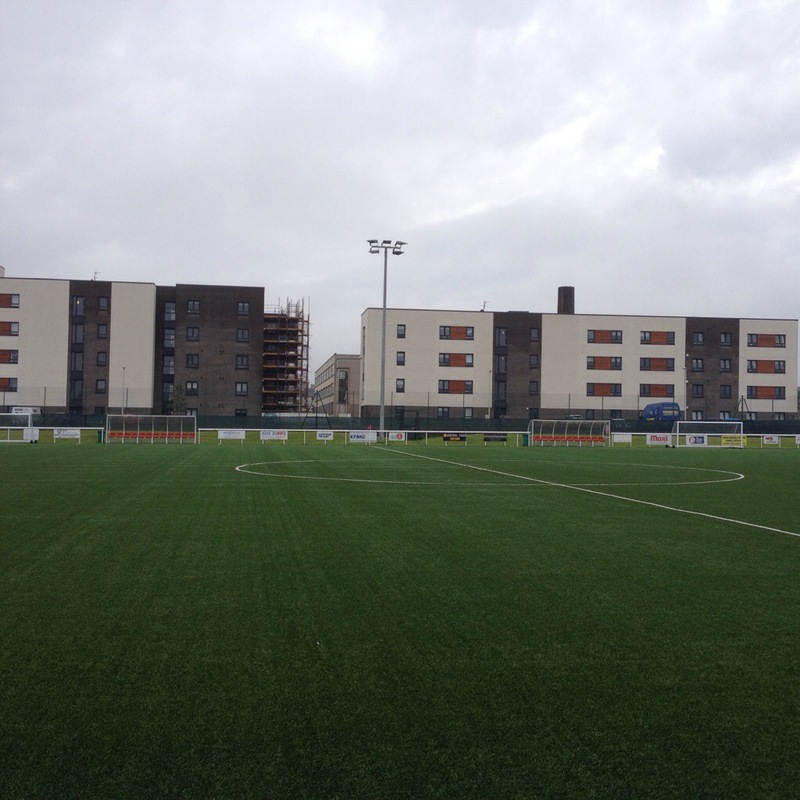 You can climb up a wall outside New Dundas Park and see a little bit inside, but not loads, and the stands aren’t that much to look at externally either. 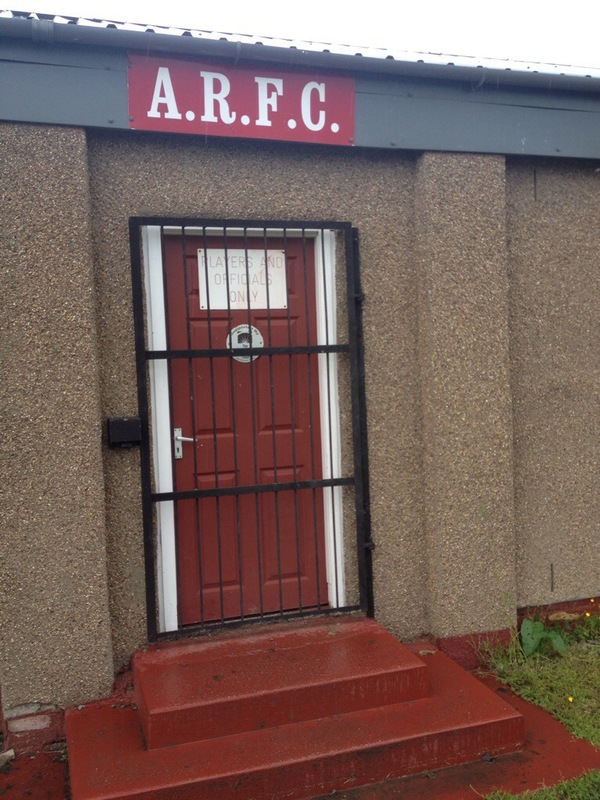 Its only real saving grace is the club’s name – Bonnyrigg Rose Athletic is probably the most Scottish moniker in all of football, including Boca Juniors. No, I didn’t get that one either. 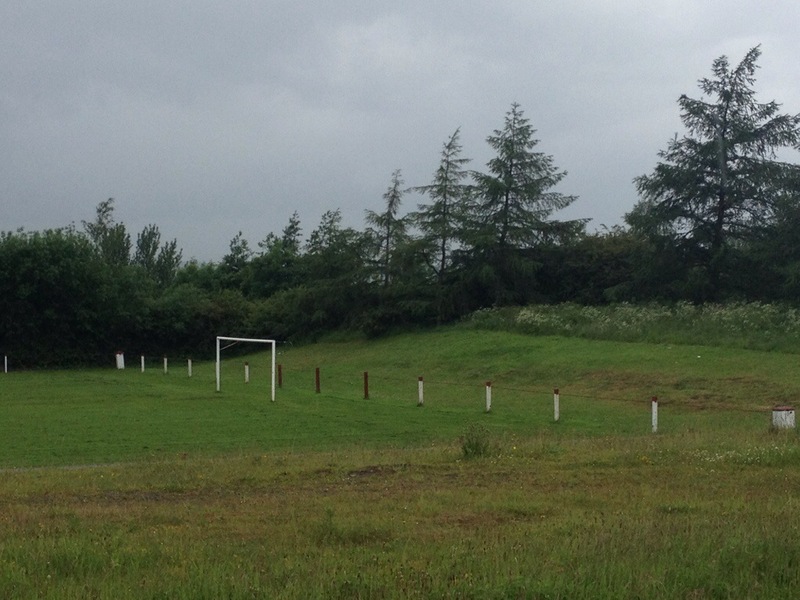 Sticking a camera over the wall means it’s possible to give you an idea what it’s like as a ground – a crumbling but quaint little corner to catch a game. And I’m undecided if goals on wheels are a point gained or point lost. 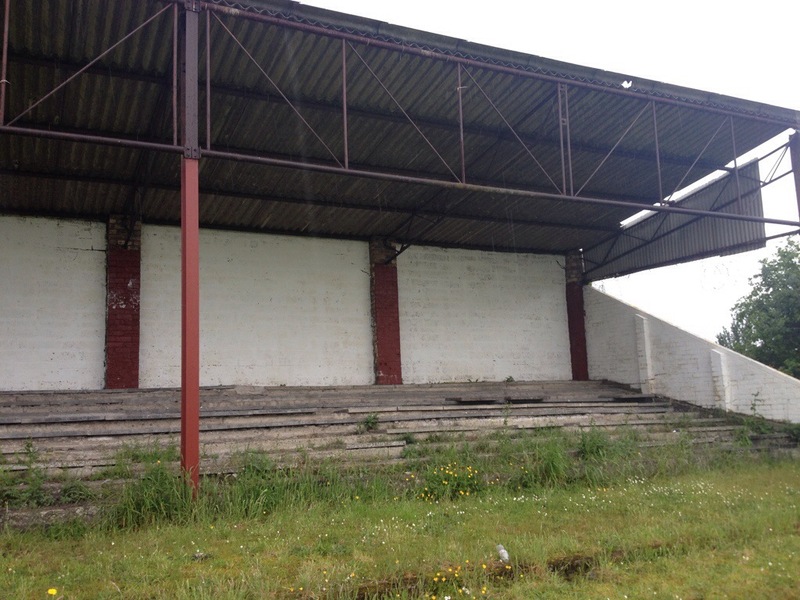 Truth be told, due to Lee having to sack the adventure off whilst here it was never going to win it any favours, but even looking back at pictures of the ground later on it didn’t do much to impress. This will go down as one of the worst grounds on our journey for a variety of reasons. Mainly as it was Lee’s last. A phone call from home as we pulled into the club car park resulted in him needing to head back to the North East, meaning it was a solo flight around the rest of the grounds. Also, nobody from the club had gotten back to us about us having a look around. 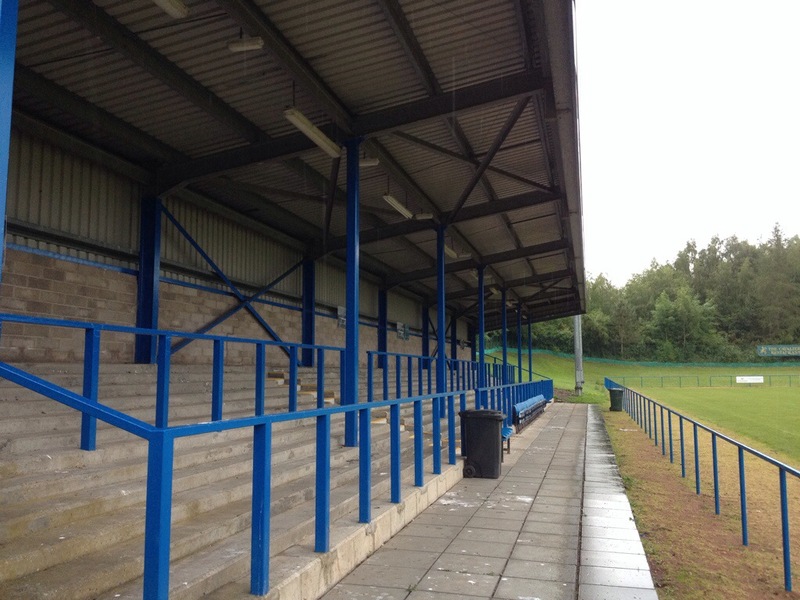 I know that’s not necessarily the point of this blog, but considering the hospitality that the likes of Newtongrange Star and Musselburgh Athletic had shown, it was a bit of a let down. 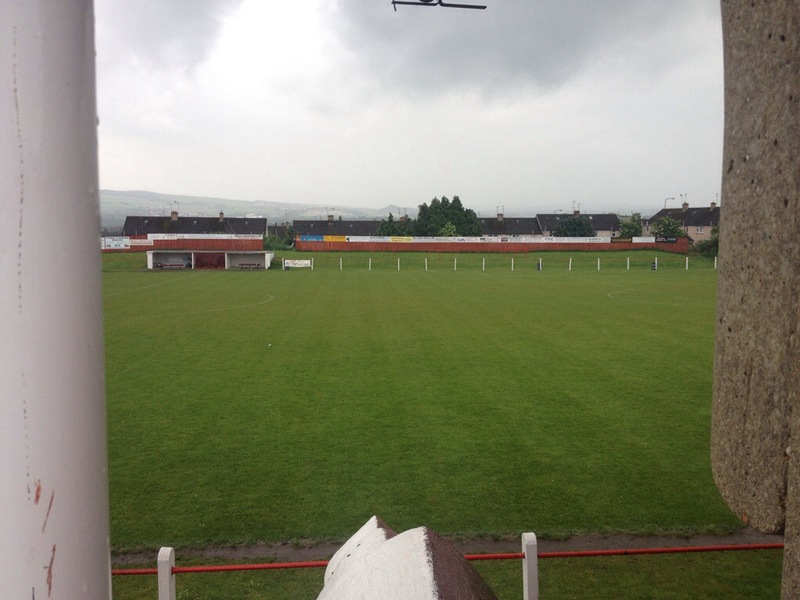 Even someone from Hampden Park had got back to us to say we could pop in when we reached Glasgow! There’s also not a great deal can be seen from the outside anyway. 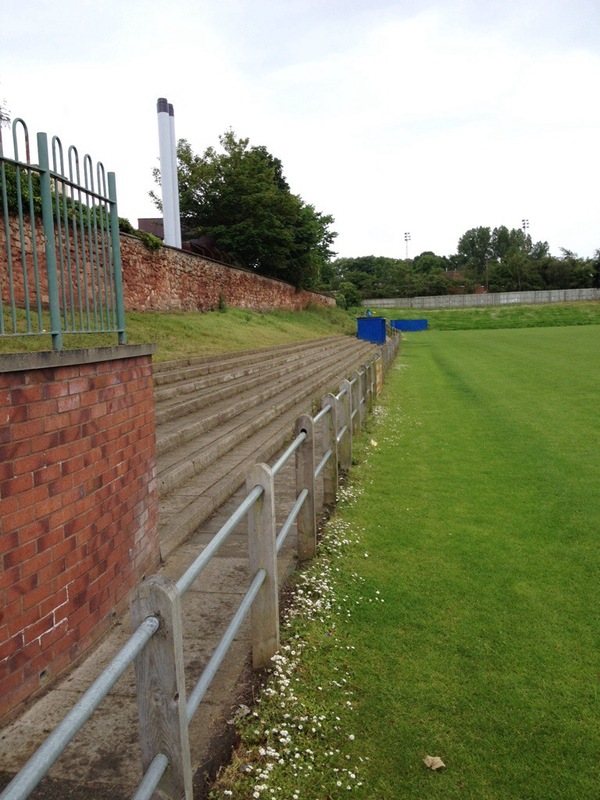 You can climb up a wall outside New Dundas Park and see a little bit inside, but not loads, and the stands aren’t that much to look at externally either. 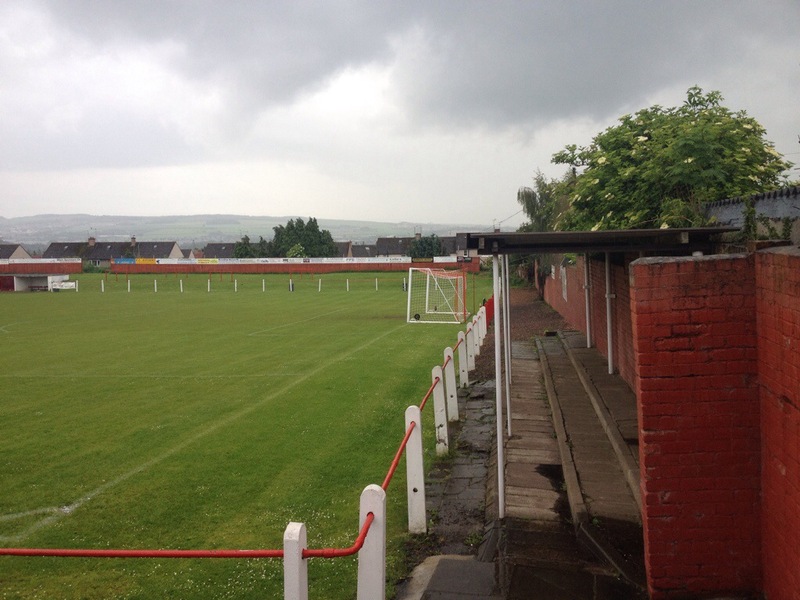 Sticking a camera over the wall means it’s possible to give you an idea what it’s like as a ground – a crumbling but quaint little corner to catch a game. And I’m undecided if goals on wheels are a point gained or point lost. 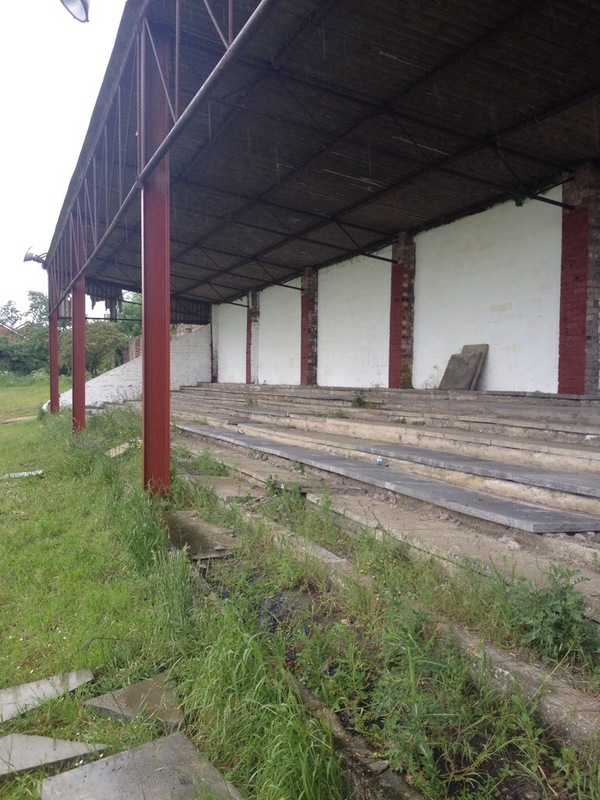 Truth be told, due to Lee having to sack the adventure off whilst here it was never going to win it any favours, but even looking back at pictures of the ground later on it didn’t do much to impress. It certainly is that. 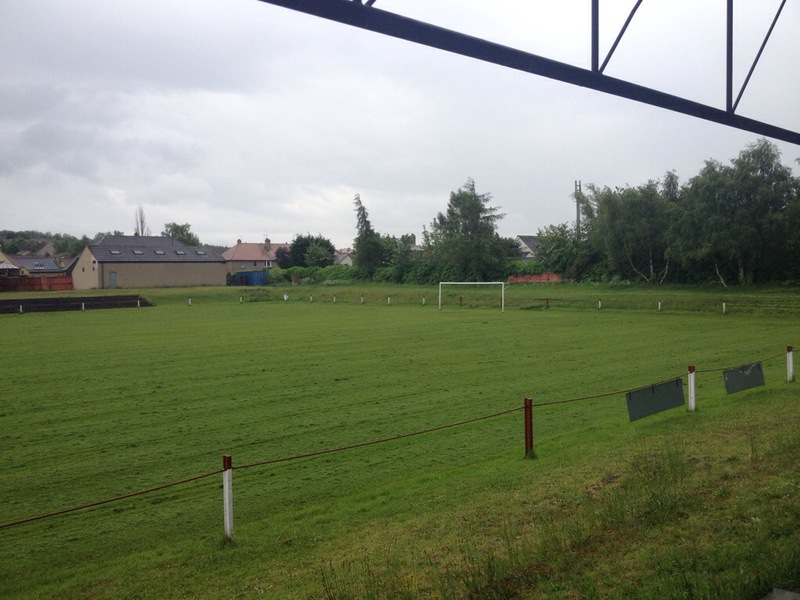 We left Newtongrange with Stan and Gordon’s best wishes and a revised route for the rest of our journey and headed out towards another Scottish junior ground. 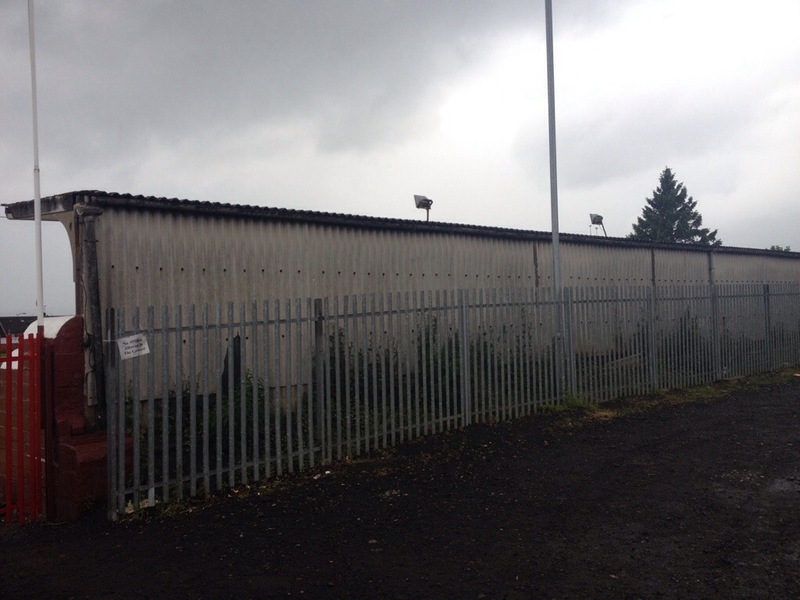 Although the gates were padlocked shut it was easy enough to see it all from the outside. 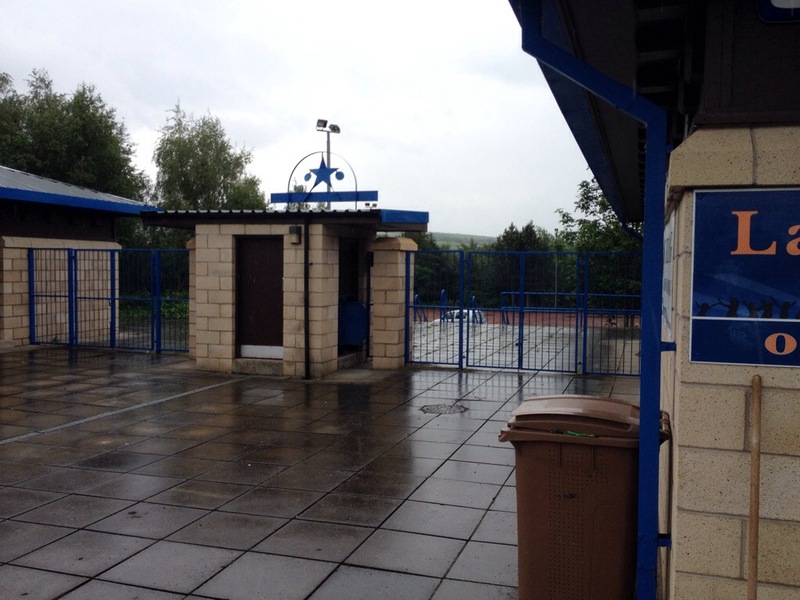 In fact, as we walked along the entrance we found a gate that was unlocked and made our way in. 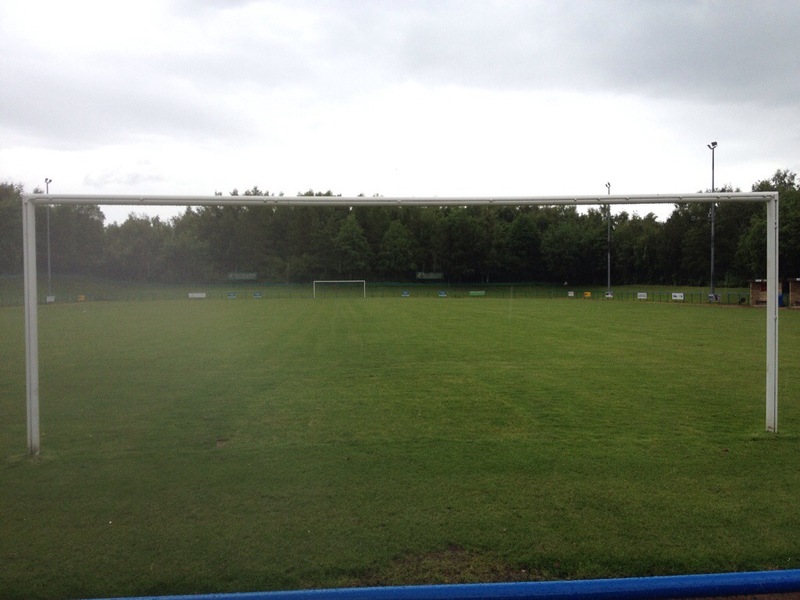 A sizeable amount of uncovered terracing stands opposite the main stand and it’s definitely a beauty. 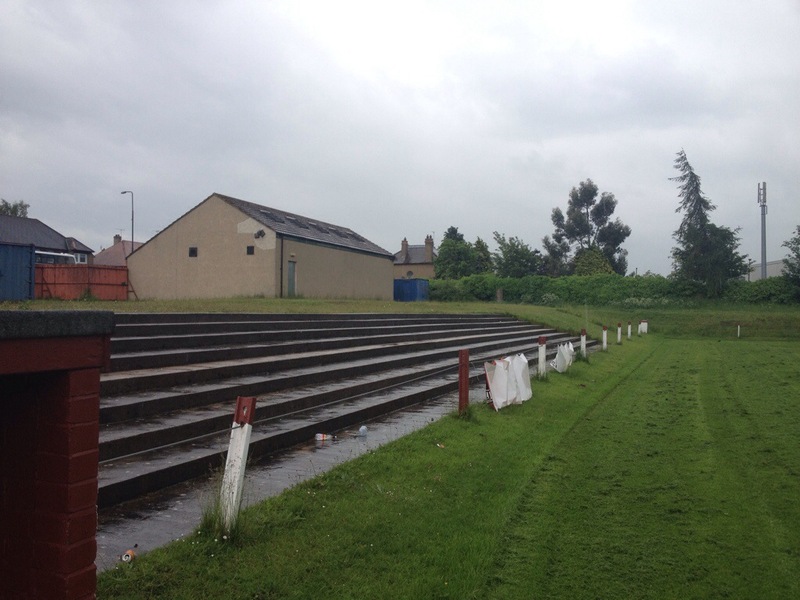 Much like the former home of Benburb FC it’s a rickety old affair that’s seen better days but it’s also magnificent. 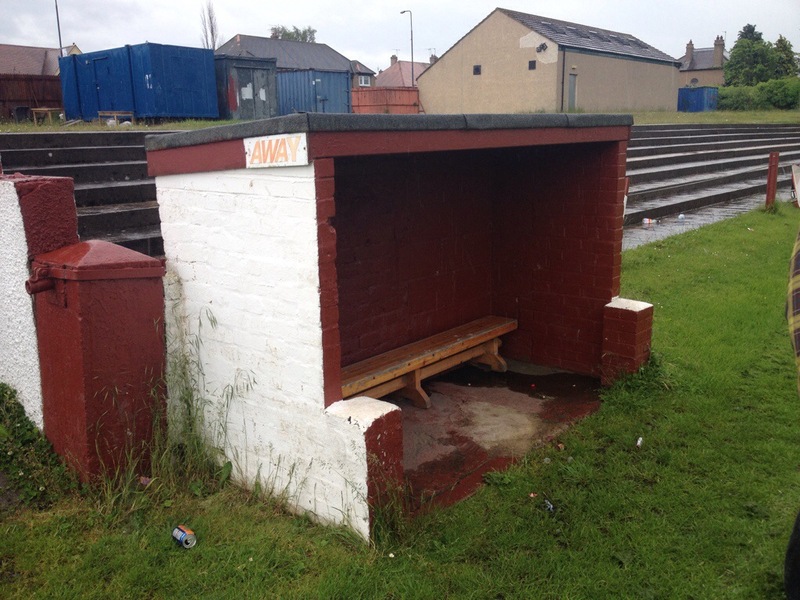 Painted in club colours it’s overgrown with paving slabs causing a health and safety nightmare but it’s impossible not to love. 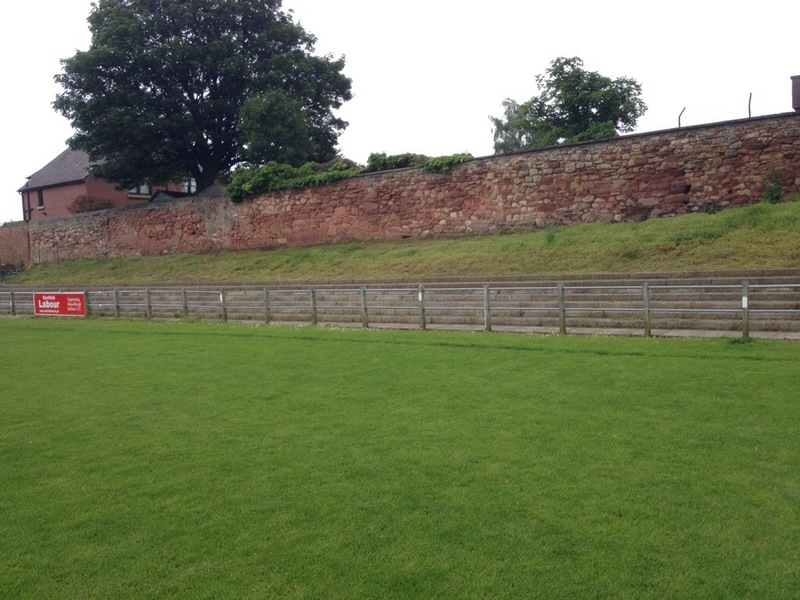 The terracing is split by a tunnel of sorts. 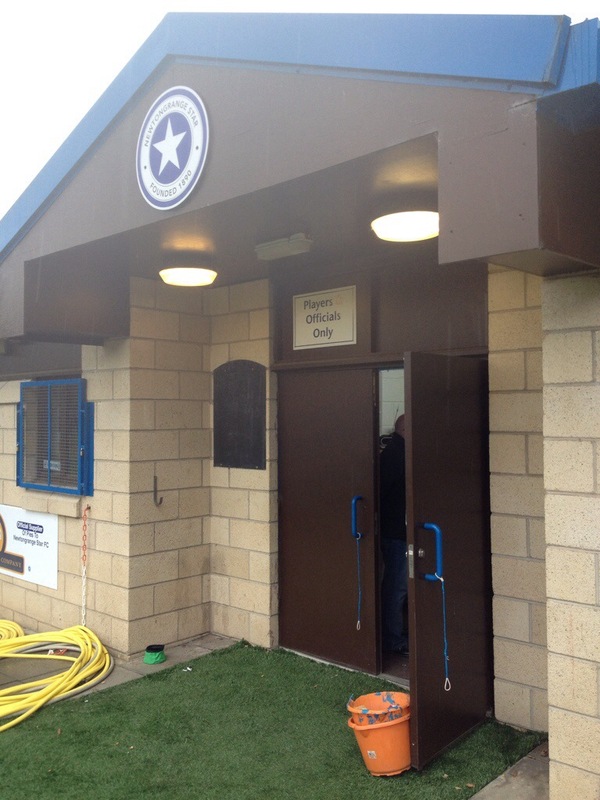 Basically a gravel path from the changing rooms to the pitch is walled off but it’s a lovely touch and helps house the dug outs in an impressive manner. Its best feature is the seat made out of crates. You’re probably thinking that it’s not actually a seat made out of crates but it is. It’s a seat made out of crates. If there’s a better chair in all of football then I look forward to seeing it. 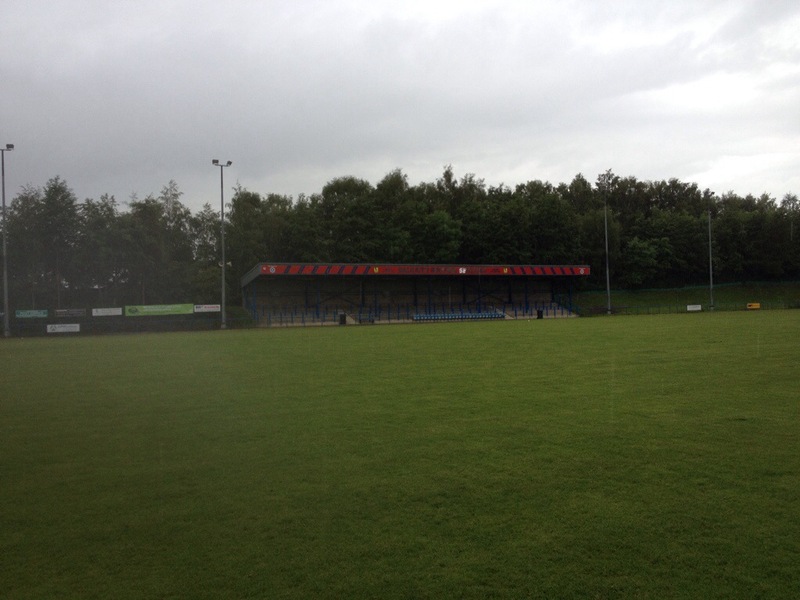 All in all it’s definitely a ground worth visiting. A wonderful old affair and even if it’s locked up when you do go there’s plenty to see from the outside. 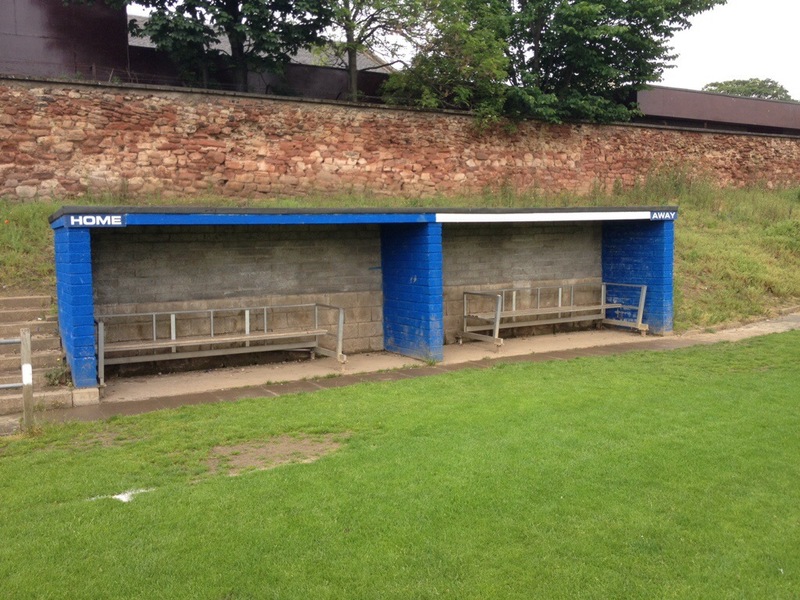 If we thought Allan Todd had looked after us at Musselburgh then we seemed to be reaching a point where clubs couldn’t do enough to help. 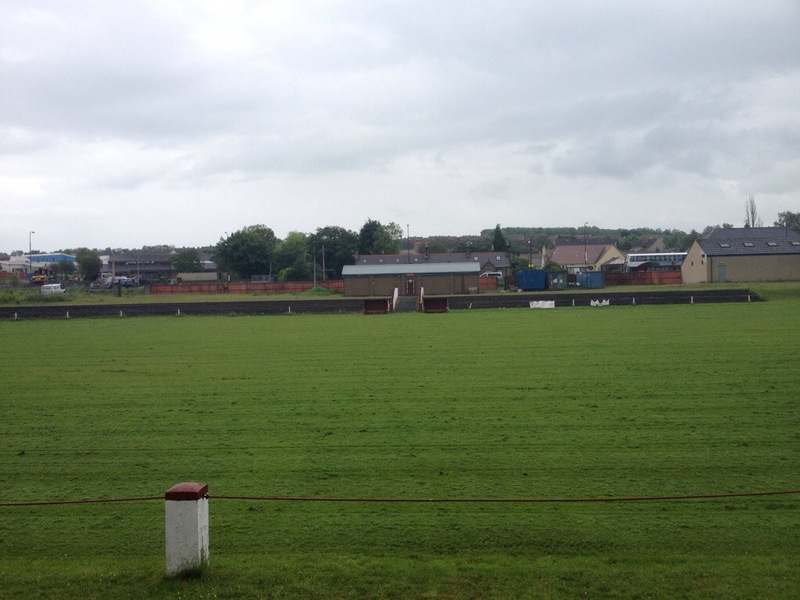 I was already excited having seen pictures of New Victoria Park on the internet and when we arrived to find Gordon Stanners, match secretary, alongside the club president Stan Adams, in a black cab outside the ground, that quickly turned to guilt. Our daft trip had resulted in people taking us far too seriously and paying taxis in order to help us? It came as a mighty relief when we discovered it was their own. I’d been happy enough with seeing the ground from the outside. They moved here in 1994 but it hasn’t aged a bit. 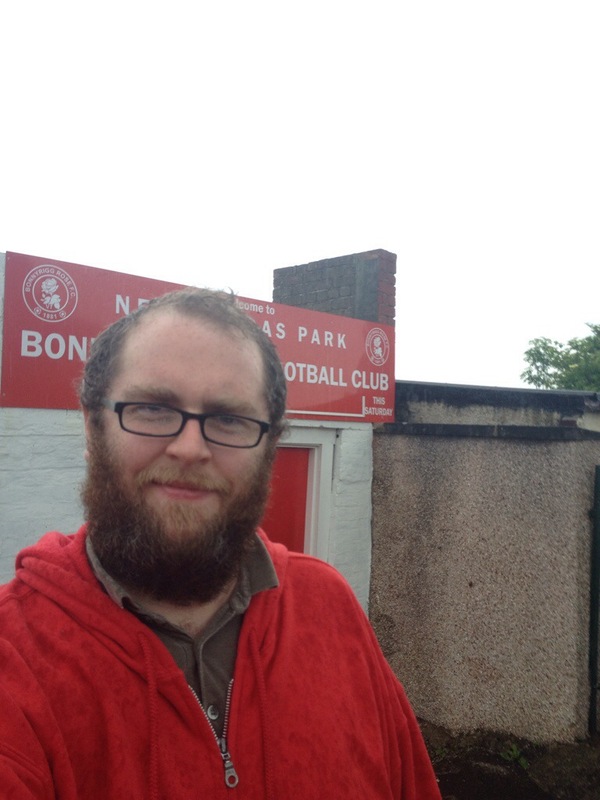 Set off the main road you have to enter the stadium up a set of stairs, which we all know bags bonus points for me. It makes it look incredibly grand and impressed us immediately. 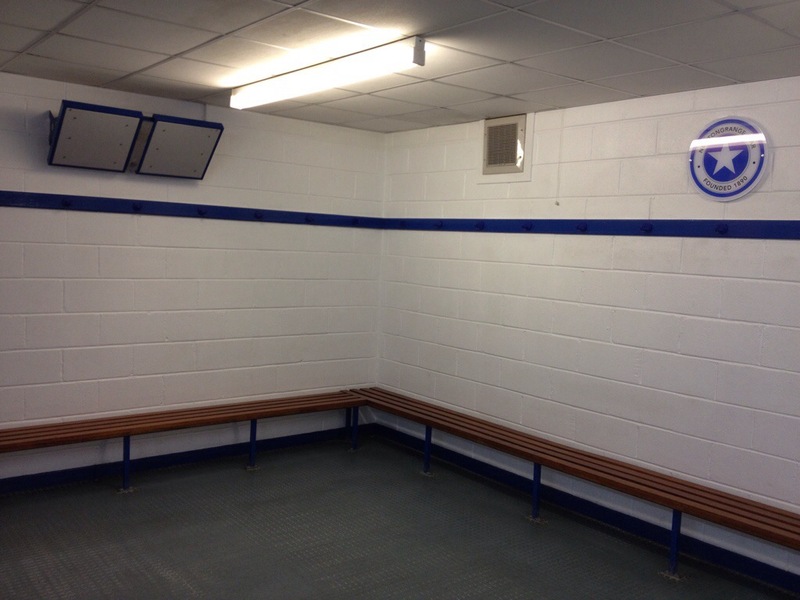 Gordon and Stan gave us a mini tour of the ground, including the home dressing room which even had a pitch marked out on the floor. I’m not quite sure what purpose this served but I loved it and we were allowed to walk out of the tunnel as Stan switched the ground’s PA on and announced us onto the pitch. 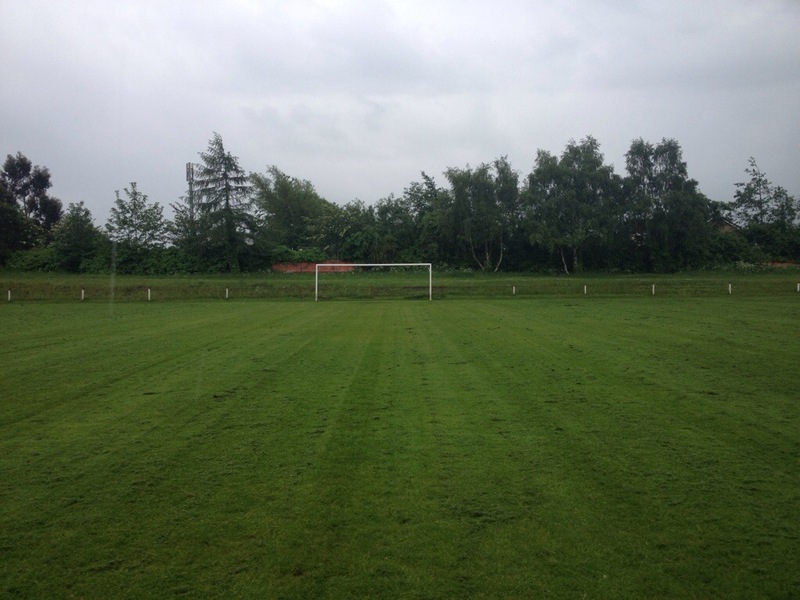 It’s a lovely setting for a ground as well, surrounded by lush greenery. 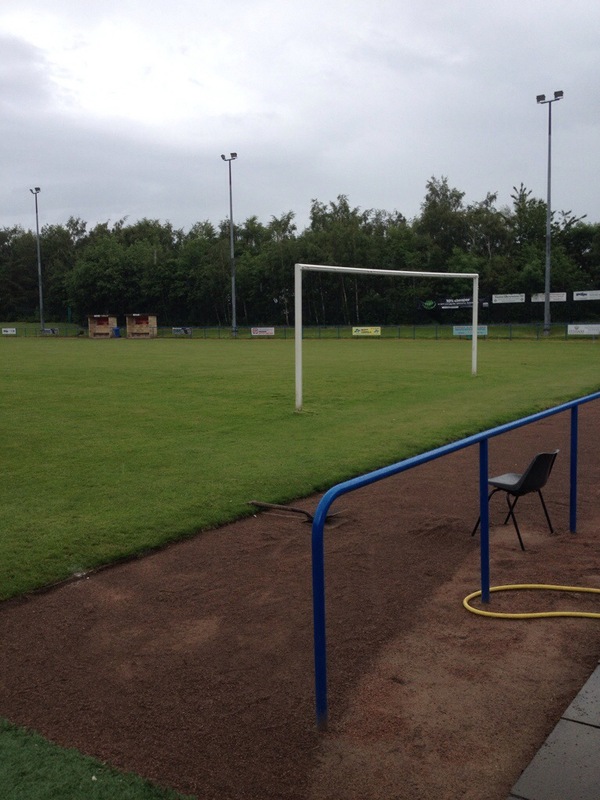 A cinder track borders most of the pitch with one side housing a very respectable sized stand. It was nice to see Mr Lang Syne use the royalties from his new year song to erect an advertising board here too. 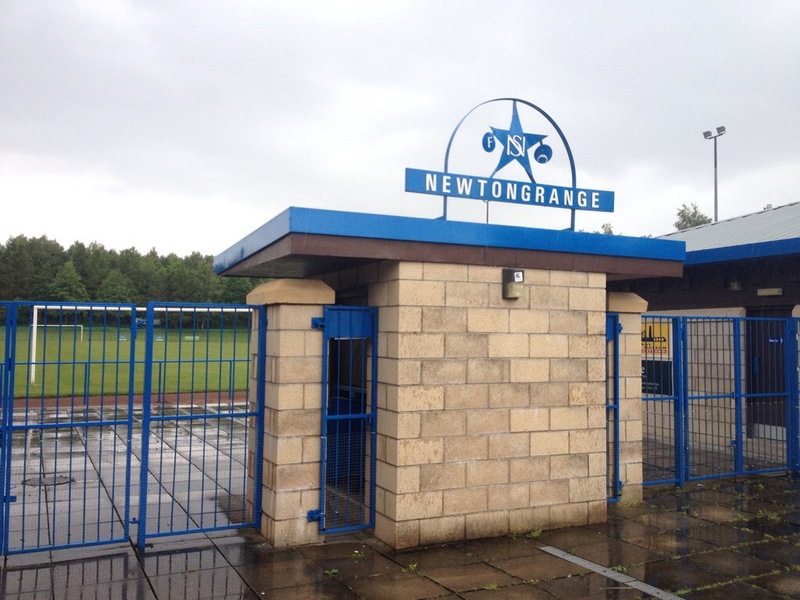 Gordon had us posing for photographs holding the Newtongrange Star scarves aloft and couldn’t have been more accommodating. 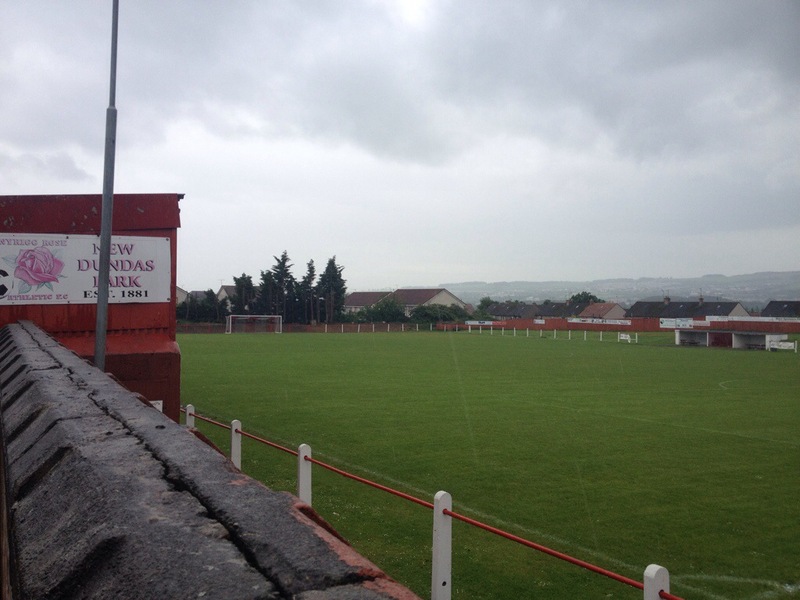 Musselburgh had been brilliant and whilst we didn’t leave Newtongrange with a mug, we didn’t feel any less welcome. In terms of my usual stance of why it’s like to visit as a tourist, I’d still recommend it. 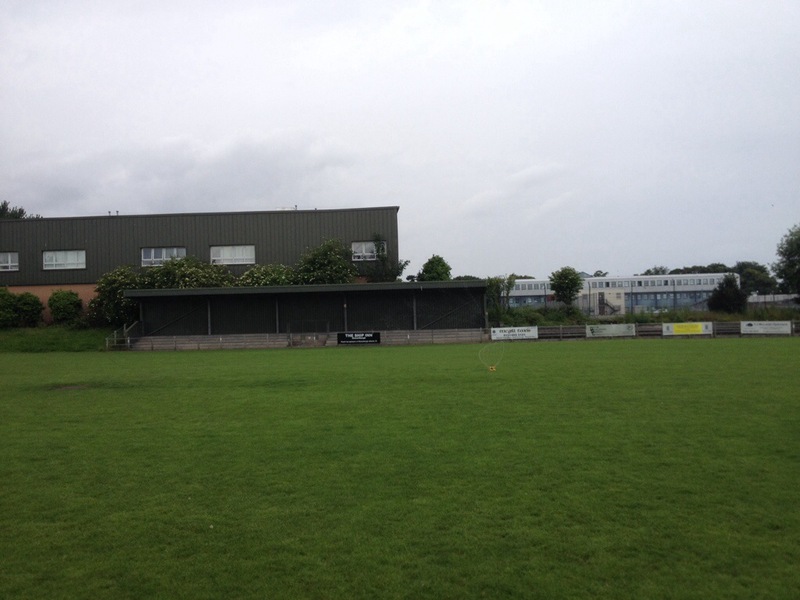 Most of the ground is visible from the gates outside, and it feels like a proper stadium. It would probably be difficult to walk around it as there’s only really access from the front gates, but you’ll be more than satisfied with that. A big thumbs up from me. 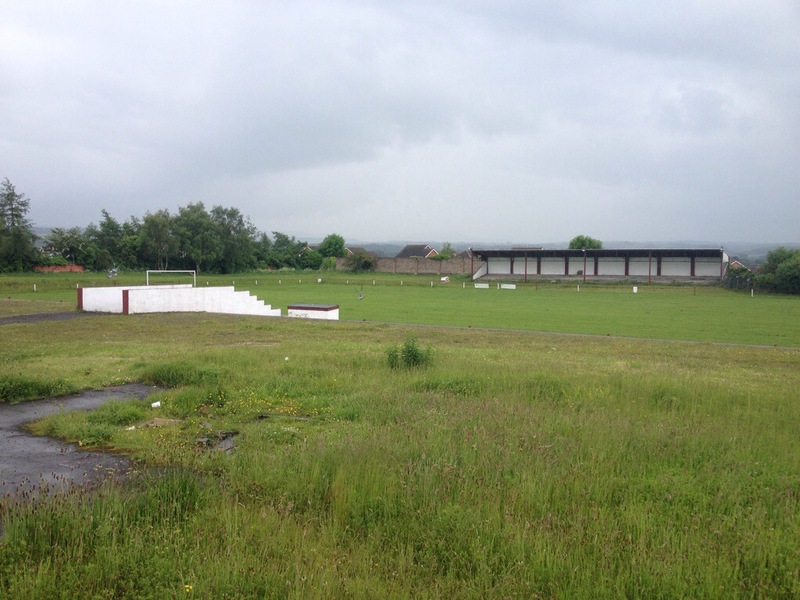 The Olivebank Stadium was one of my favourites on our Scottish road trip despite being relatively anonymous if you were visiting as a neutral. Because Lee and I had been in touch with all of the clubs we visited in advance, a lot of them were happy to let us in for a wander around. 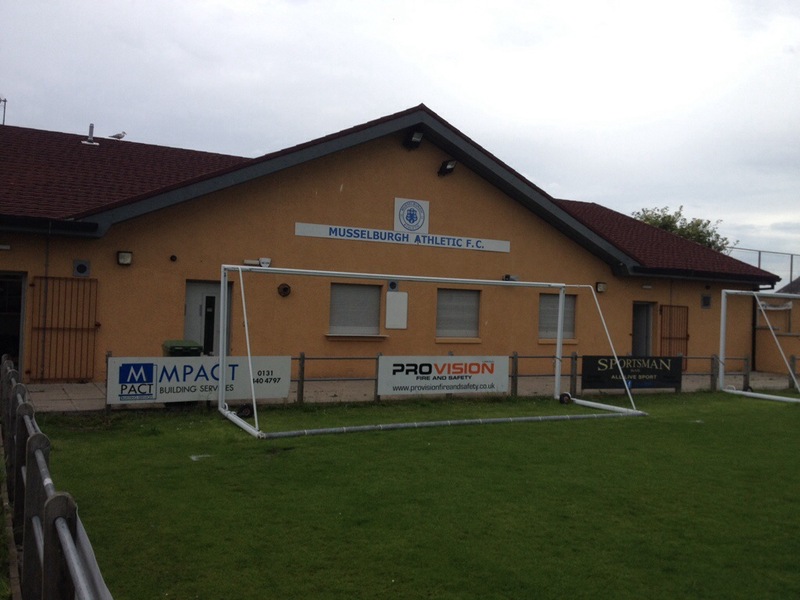 In Musselburgh Athletic’s case, they really went the extra mile. 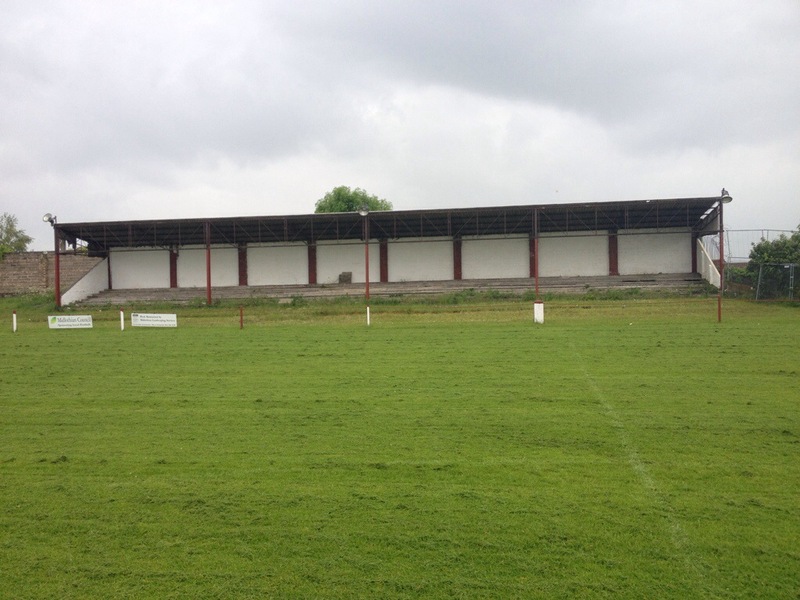 There’s not a lot to see of it from the outside – it’s down a back lane and the entrance blocks off a lot of the view of the ground – so it was a good job Allan Todd was there to meet us. 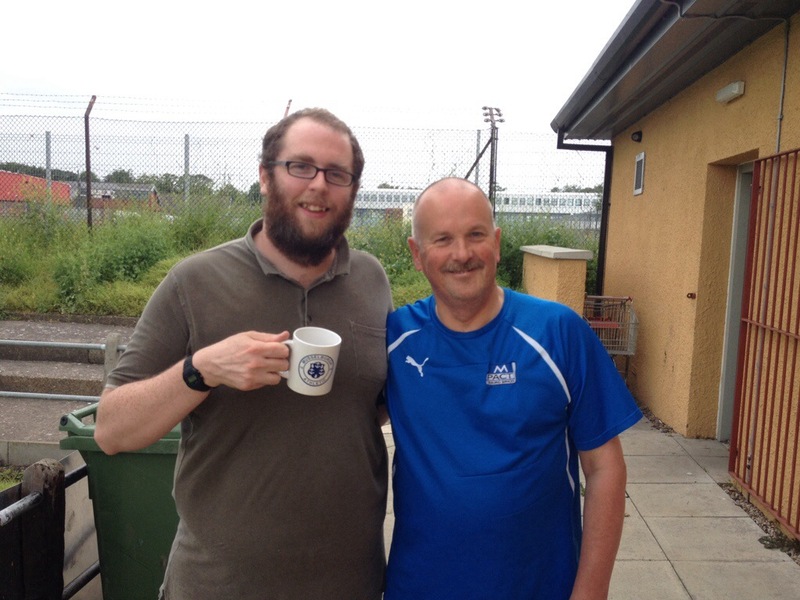 He welcomed us in, showed us around and even gave us a pair of Musselburgh Athletic mugs. Brilliant! In terms of the ground itself, the name sounds grander than it is. 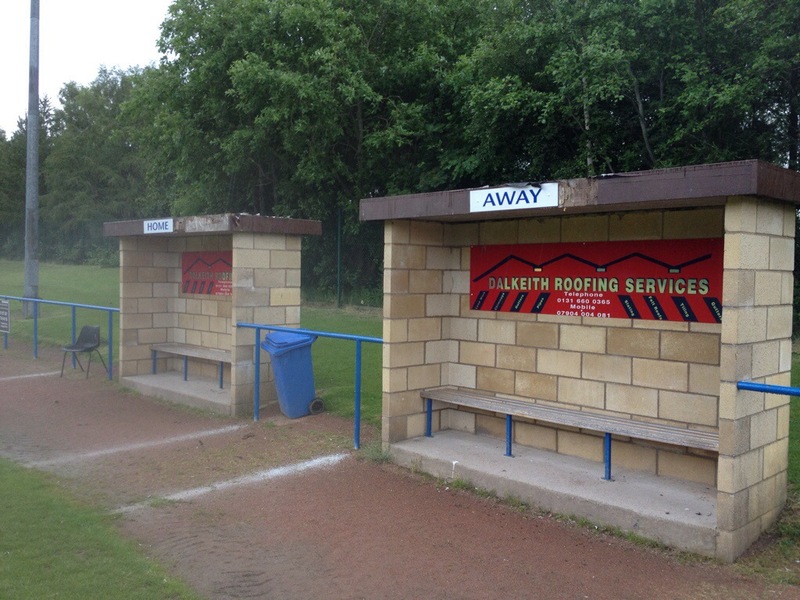 The club get very healthy attendances for the Scottish junior leagues but there’s only one small stand for shelter. 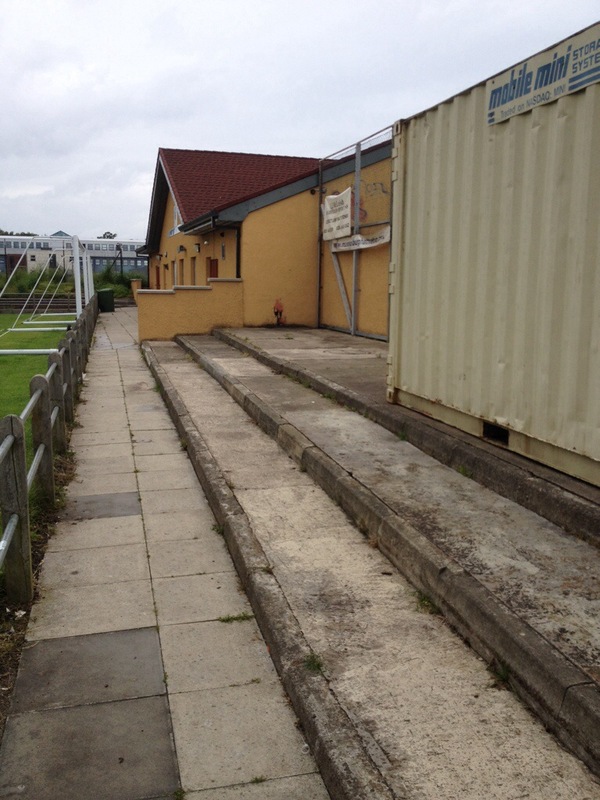 There is some terracing too and with a factor backing onto the ground, it feels very closed in. I’d definitely suggest a visit. 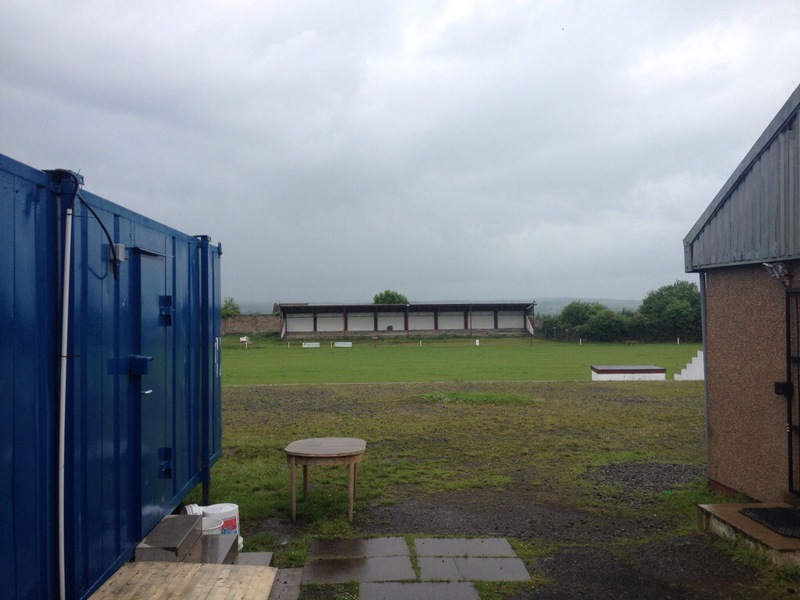 Although if the ground’s locked there won’t be much to see, if anyone is about then the club seem incredibly friendly and happy to show you around. 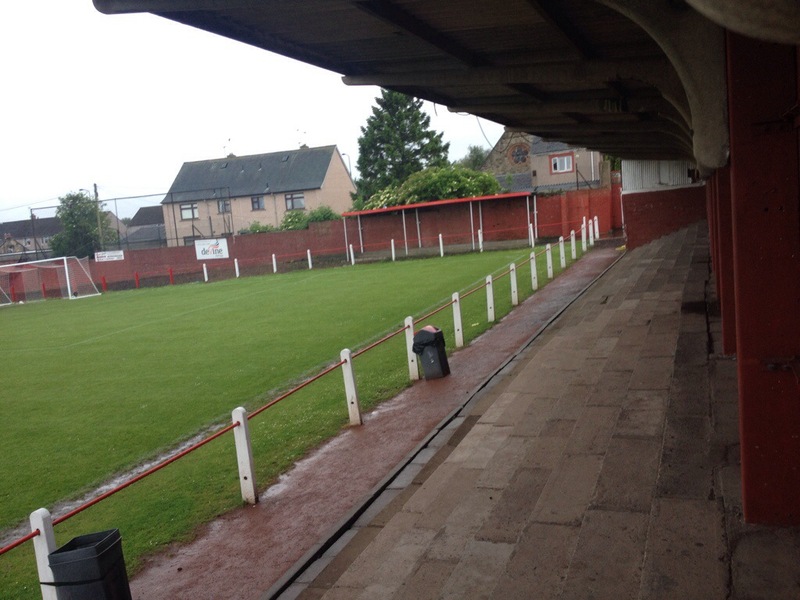 And it’s close enough to Tranent Juniors and Preston Athletic to be worth it just on the off-chance.